William R. Singleton Hope Lebanon Lodge #7, in its present incarnation is made up of several Lodges that over the years have joined together in perfect union to a make a strong fraternity. William R. Singleton - Hope - Lebanon Lodge #7, has a long and rich history in the Tenleytown neighborhood, and has been an active part of the community for almost 200 years. In 1811, it was the first Lodge chartered by the Grand Lodge of Free And Accepted Masons in the District of Columbia. Lebanon Lodge # 7 was originally chartered on October 8, 1811 and was one of the first two Lodges chartered by the Grand Lodge of the District of Columbia. Lebanon Lodge #7 consolidated with William R. Singleton-Hope Lodge on November 9, 1987. Hope Lodge No. 20 was chartered on May 7, 1867 and consolidated with William R. Singleton Lodge on December 5, 1985. 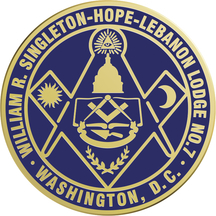 William R. Singleton Lodge #30 was chartered on May 8, 1901 with members drawn from the Tenleytown neighborhood and named in memory of a distinguished and beloved Mason who served as Grand Secretary for 26 years from 1875 until his death in February 1901. Barristers Lodge No. 48, as the name suggested composed largely of members of the legal profession, was consecrated on February 6, 1929 and merged with the former Lebanon Lodge on January 18, 1977. After these four Lodges were officially merged in 1987, the lowest and oldest number was accepted, and the name became William R. Singleton-Hope-Lebanon Lodge No. 7.